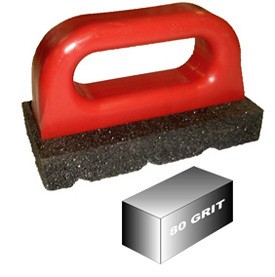 Rub bricks with the red handle are for hand grinding and finishing concrete and masonry. The 2 x 2 x 4 floor stones are typically used in sets of six on machines like the Edco floor grinder. Wedges are normally used to hold the stones in the machine.